Some medical conditions interfere with the electric current needed to move muscles and nerves. Electromyography, or EMG, involves testing the electrical activity of muscles. Often, EMG testing is performed with a nerve conduction study. An EMG test is an important tool for diagnosing such electrical imbalances or abnormalities that might be causing or aggravating your illness or discomfort. EMGs can detect abnormal muscle electrical activity in many diseases and conditions, including inflammation of muscles, pinched nerves, damage to nerves in the arms and legs, disc herniation, and degenerative diseases such as Muscular Dystrophy, Lou Gehrig’s Disease and Myesthenia Gravis, among others. The EMG helps doctors distinguish between muscle conditions that begin in the muscle and nerve disorders that cause muscle weakness. The Cadwell Corporation is one of the leading manufacturers of diagnostic equipment.The Sierra® Summit™ is the newest addition to the popular and innovative Sierra product line. This EMG machine combines the intuitive Sierra Wave™ software with an all new, state-of-the-art, data acquisition/stimulation hardware platform. Key additions include an audiophile-quality dual speaker system (with graphic equalizer), color-coded durable connectors, ergonomically re-designed keypad, 4 trigger inputs and 4 trigger outputs for maximum flexibility with external devices, two independent electrical stimulators, internal hardware diagnostics, electrode continuity check, and our new CadLink™ database for improved workflow and central management of user settings. The Summit can be configured with either a 2, 6 or 12 channel amplifier. Each amplifier has increased CMRR, superior RF immunity, low stimulus artifact, and a fast recovery design. The familiar Sierra Wave user-interface is preserved, and the system is fully compatible with Sierra Wave patient files and test settings. The Summit supports the full range of electrodiagnostic tests, and has built-in flexibility to support new protocol development and research applications. 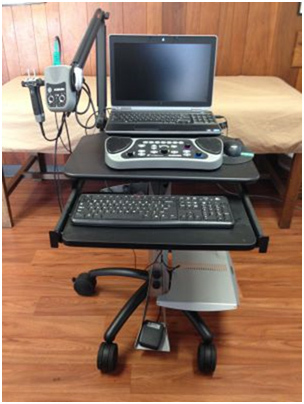 The basic system includes a 2, 6 or 12 channel amplifier with EMG, QEMG (MUP and IP), NCV, F Wave, H-Reflex, RNS, Blink, Somatosensory EP, Single StimTroller™ Plus Handheld Electrical Stimulator, Autonomic Studies, CadLink database, and customizable Report Generation (including the Auto Findings Composer™). Advanced features include Auditory EP, Visual EP, P300, Single Fiber EMG, MUNE, Dual Electrical Stimulation with Advanced Stimulation Controls, and CadLink Server. Dr. Caruso is a firm believer in the importance of understanding the full picture of a patient’s metabolic and bio-mechanical functionality. The spinal and nervous system is a major component of a system whose overall function involves many complex interactions. Knowing more about the patient helps insure that an appropriate treatment plan can be developed.